Product prices and availability are accurate as of 2019-03-04 15:46:45 GMT and are subject to change. Any price and availability information displayed on http://www.amazon.co.uk/ at the time of purchase will apply to the purchase of this product. 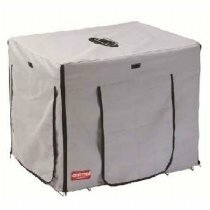 Provide extra protection and privacy with the Animal Instincts Comfort Crate Cover. With handy pockets for storing toys and food, as well as a closable flap for ease of access. Suitable for Animal Instincts Comfort Crate size 1.